Study data mining and warehousing. Understand the database implications of efficient and effective transaction processing, including error handling, data validation, security, stored procedures and triggers, record locking, commit and rollback. The purpose of the first week's lab is to review the SQL language, and familiarize you with the database example that we will use in labs through this course. If you have not done it yet, please download the MovieRentals.SQL file to your computer from Doc Sharing. This script file will need to be run once logged into your Oracle user account to create the tables and data that will be used for this lab and subsequent labs in the course. Before attempting Lab 1, you need to be sure you have read through the SQL*Plus tutorial which can be found in Doc Sharing as well as under the SQL*Plus Tutorial tab in Week 1. This tutorial describes the functionality of the editor and will step you through the process of setting up and using the SQL*Plus in the iLab environment so that it will best serve your needs for the remainder of the labs required for this course. Once you have logged into Oracle through iLab then execute the MovieRental.SQL script and create the tables and data for the lab. 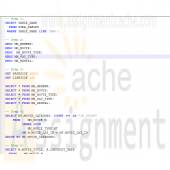 For the lab, you will need to create a script file containing the eight queries that will address the lab steps below. Run the script file in your SQL*Plus session using the SET ECHO ON session command at the beginning to capture both the query and result set. Spool your output to a file named with your last name plus lab 1 and give the file a text (.txt) extension. For example, if your last name was Johnson then the file would be named johnson_lab1.txt. Submit both the spooled output AND the script file for grading of the lab. Within SQL*Plus, list names of the tables that you have created whose name starts with MM (Hint: use data dictionary view USER_TABLES). Use DESCRIBE (in short: DESC) command in SQL*Plus for each of these tables to show columns and their datatypes. Use SELECT * command to display all data from each of the tables in the MoreMovies schema. Make sure that the LINESIZE and PAGESIZE have large enough values, and that you format columns so that the report looks good. You should end up with five queries and result sets. Using the mm_movie and mm_movie_type tables, write a query that will list all movie categories together with the count of movies in each category. Give the column with the count in it a meaningful name such as IN STOCK. Using the mm_movie and mm_rental tables, write a query that will list titles and checkout dates for all movies that were signed out by Wild Coyote (MEMBER_ID=13). Using the same two tables used in Step 5, write an SQL sub-query that will list all movies (movie ids and titles) of all movies that have never been rented. Using the mm_member and mm_rental tables, write a query that will list all members (member ID, first name, and last name) and the number of movies they have rented, for all members who have rented at least one movie. Order the result set so that it shows the largest number of movies rented as the first row. Write a query that will display the largest number of movies rented by one member and that member's name. Give the output column a meaningful name such as MAXIMUM NUMBER. Using the mm_member and mm_rental tables, write a query that will display member ID, last name, first name, and the number of movies rented for each member. Give the column with the number of movies rented a meaningful name such as NUMBER RENTED. Using the mm_member, mm_movie and mm_rental tables, write the query that will prepare a report that shows who rented which movie. Use member names (first and last) and movie title rather than the corresponding IDs. Order the report by member names, and for a single member by the movie titles. This concludes the Lab for Week 1. The purpose of this week's lab is to work with basic PL/SQL syntax to create an anonymous block of code. In the lab, you will be using SQL*Plus to modify one of the tables in the MovieRental schema and then write a simple block of code to update the table with some new data and then execute the code in SQL*Plus. As an additional task in the lab, you will be asked to modify the existing PL/SQL block of code given to you to add exception handling and then execute it in SQL*Plus. Both of these concepts will help enforce the material covered in this second week. For the lab, you will need to create a script file containing the PL/SQL code that will address the lab steps below. Run the script file in your SQL*Plus session using the SET ECHO ON session command at the beginning to capture both the PL/SQL block code and output from Oracle after the block of code has executed. To successfully test the code in Step 3, you will need to copy/paste your code into SQL*Plus for each movie ID as you change the value for the host variable. Spool your output to a file named with your last name plus lab 2 and give the file a text (.txt) extension. For example, if your last name was Johnson then the file would be named johnson_lab2.txt. Submit both the spooled output AND the script file for grading of the lab. As business is becoming strong and the movie stock is growing for More Movie Rentals, the manager wants to do more inventory evaluations. One item of interest concerns any movie for which the company is holding $75 or more in value. The manager wants to focus on these movies in regards to their revenue generation to ensure the stock level is warranted. To make these stock queries more efficient, the application team decides that a column should be added to the MM_MOVIE table named STK_FLAG that will hold a value '*' if stock is $75 or more. Otherwise, the value should be NULL. Add the new column to the MM_MOVIE table as a CHAR data type. Execute a DESC MM_MOVIE on the table both before you add the new column and after the column is added. Note: Since this is code will be in your script file, you will need to comment it out after the first time you have execute the ALTER TABLE statement successfully to avoid getting errors each additional time your script file is run. Create an anonymous block of PL/SQL code that contains a CURSOR FOR loop to accomplish the task described above in Step 1. Your loop will need to interrogate the value (using an IF statement) found in the movie_qty field of the cursor loop variable to see if it is >= 75. If this is true then you will need to update the new column in the table with an '*' WHERE CURRENT OF the table. If the quantity is not >= 75 (the ELSE side of the IF statement) then update the new column with a NULL. Execute a SELECT * from MM_MOVIE both before and after you execute the new PL/SQL block of code to show that the process works. Here is a block that retrieves the movie title and rental count based on a movie ID provided via a host variable. Modify the block of code to add exception handlers for errors that you can and cannot anticipate. You will need to execute the entire code listing shown above each time you wish to test it by changing the value of :g_movie_id for each test. Once finished, test your exception handling by running the modified block for the following values of :g_movie_id. Be sure that you can capture the value in the :g_movie_id host variable. This concludes the Lab for Week 2. Your first procedure is to be named MOVIE_RENTAL_SP and is going to provide functionality to process movie rentals. Based on data that will represent the movie ID, member ID, and payment method your procedure will need to generate a rental ID and then insert a new row of data into the mm_rental table. The process will also need to update the quantity column in the mm_movie table to reflect that there is one less copy of the rented movie in stock. Along with the processing, you will also need to define some user-defined exception handlers that will be used in validating the input data. Since you may need to recreate your procedure several times during the debugging process, it is suggested that you use the CREATE OR REPLACE syntax at the beginning of the CREATE statement. The following steps will help you in setting up your code. 1. You will need to define three parameters, one each for movie ID, member ID, and payment method. Make sure that each one matches the data type of the associated column in the database tables. 2. You will have several other variables that will need to be identified and defined. It might be easier to read through the rest of the specs before you start trying to define these (look for hints in the specifications). 3. You will need to define four user-defined exceptions; one for unknown movies, one for unknown member, one for unknown payment method, and one for if a movie is unavailable. 4. You will need to validate each of the three pieces of data passed to the procedure. One easy way to do this might be to use a SELECT statement with the COUNT function to return a value into a variable based on a match in the database table against the piece of data that you are validating. If the query returns a zero then there is no match and the data is invalid; any value greater than zero means a match was found and thus the data is valid. You will need the following validations. 1. Validate the movie ID to make sure it is valid. If not then raise the unknown movie exception. 2. Validate the member ID to make sure one exists for that ID. If not then raise the unknown member exception. 3. Validate the payment method to make sure it exists. If not then raise the unknown payment method exception. 4. Check the movie quantity to make sure that there is a movie to be rented for the movie ID. If not then raise the unavailable movie exception. 5. If all the data passes validation then you will need to create a new rental ID. This process should be in a nested block with its own EXCEPTION section to catch a NO_DATA_FOUND exception if one should happen. You can generate a new rental ID by finding the largest rental ID value in the mm_rental table (Hint: MAX function) and then increasing that value by one. The NO_DATA_FOUND exception would only be raised if there were no rental IDs in the table. 6. Now you are ready to insert a new row of data into the mm_rental table. Use the SYSDATE function for the checkout date and NULL for the check-in date. 7. Now, update the mm_movie table to reflect one less movie for the associated movie ID. 8. Finally, you will need to set up an EXCEPTION section for all of your exception handling. For each exception output, you want to state what the problem is, the invalid data value, and a note that the rental cannot proceed. For example, for an invalid movie ID number, you might say, "There is no movie with id: 13 - Cannot proceed with rental". You also want to include a WHEN OTHERS exception handler. Compile and check your code. If you get a PROCEDURE CREATED WITH COMPILATION ERRORS message then type in SHOW ERRORS and look in your code for the line noted in the error messages (be sure to compile your code with the session command SET ECHO ON). Once you have a clean compile then your are ready to test. You will need to test for scenarios that will allow both a clean movie rental and test each exception. This means that you will need to run at least five test cases. 1. No movie for the ID supplied (use 13, 10, and 2 for the parameters). 2. No member for the ID supplied (use 10, 20, and 2 for the parameters). 3. No payment method for the ID supplied (use 10, 10, and 7 for the parameters). 4. A successful rental (use 5, 10, and 2 for the parameters). 5. No movie available for the ID supplied (use 5, 11, and 2 for the parameters). Since there is only one movie available for ID 5, you will get this exception. Be sure that when you have verified that everything works, you run your testing in a spools session and save the file to be turned in. Your second procedure should be named MOVIE_RETURN_SP and should facilitate the process of checking a movie rental back in. For this procedure, you will only need to pass one piece of data to the procedure; the rental ID. You will need two user-defined exceptions; one for no rental record and one for already returned. You will be able to use several of the same techniques you used in the first procedure for your validation. The following steps will help in setting up your code. 1. You will need to define only one parameter for the rental ID number. Make sure that it matches the data type of the associated column in the database table. 3. You will need to define the two user-defined exceptions mentioned above. 4. You will need to validate the rental ID that is passed to the procedure. If it is not a valid one then raise the associated exception. 5. If it is valid then get the movie ID and check-in date from the mm_rental table. 6. Now, check the check-in date to make sure that it is NULL. If it is not then raise the associated exception. 7. If everything checks out then update the mm_rental table for the rental ID you have and use the SYSDATE function for the check-in date. 8. Now, you can update the quantity in the mm_movie table for the associated movie ID to reflect that the movie is back in stock. 9. Last, set up your exception section using appropriate error message text and data. You will need to test for scenarios that will allow both a clean rental return and test each exception. This means that you will need to run at least three test cases. 1. No rental for the ID supplied (use 20 for the parameter). 2. A successful rental return (use 1 for the parameter). 3. Try to return the same rental in Step 2. Your function should be named MOVIE_STOCK_SF and will be used to return a message telling the user whether a movie title is available or not based on the movie ID passed to the function. The exception handling that will be needed is for NO_DATA_FOUND but we are going to set it up as a RAISE_APPLICATION_ERROR. 1. You will need to define only one parameter for the movie ID number. Make sure that it matches the data type of the associated column in the database table. Also, since you will be returning a notification message, you will want to make sure your RETURN statement references a data type that can handle that (Hint: variable length data type). 3. You will not be doing any validation so the first thing you need to do is retrieve the movie title and quantity available from the mm_movie table based on the ID passed to the function. 4. Now, you need to determine if any are available. IF the value in the quantity column is greater than zero then you will be returning a message saying something like "Star Wars is available: 0 on the shelf", ELSE if the value is zero then you should return a message saying something like "Star Wars is currently not available". Hint: A good way to return a test string is to assign it to a variable and then simply use the variable name in the RETURN clause. 5. Finally, set up your exception section to use a RAISE_APPLICATION_ERROR for the NO_DATA_FOUND exception handler. Assign an error number of -20001 to it and an error message that states there is no movie available for the ID (be sure to include the id in the message). Compile and check your code. If you get a FUNCTION CREATED WITH COMPILATION ERRORS message then type in SHOW ERRORS and look in your code for the line noted in the error messages (be sure to compile your code with the session command SET ECHO ON). Once you have a clean compile then your are ready to test. You will need to test for all three possible scenarios. 1. Test for a movie in stock using movie ID 11. 2. Test for a movie not in stock using movie ID 5 (from your tests of the second procedure above, the quantity should be 0). 3. Test for an invalid movie ID using movie ID 20. For test number 2, you may need to manipulate the quantity amount in the database, which will be fine. This concludes the Lab for Week 3. Your deliverable submission should consist of your Lab 3 script file and the spooled output files described at the beginning of the lab. If you would like, you can include both files in a single ZIP file to be submitted to the Week 3 Lab Dropbox. Before you begin, there are several things you will want to do to get ready for the lab. 1. Refresh your database tables by running the movierental.sql script. This will restore all of the data back to where it was in the beginning for the course. 2. Drop the two procedures and the function created in Lab 3. Be sure that you have your script file from Lab 3 so you can copy the procedure and function code from it. Now you are ready to create your package specification. Your package name should be MM_RENTALS_PKG and it will contain the two procedures and the one function that were created in Lab 3. Remember that for the specification, you only need to list the procedure and function header data (CREATE statement with parameters). Test your package specification by running the script in SQL*Plus. If you have any errors, debug them and once you have a clean compile, move on to Step 2. Creating the package body should be simple since you already have the code for the two procedures and the function, and you know it works. Remember that the name for the package body must match the name of the specifications, and that the procedure and function header in the body must match that of the specification exactly. Once you have created the body then run the script in your SQL*Plus session. Once you have a clean compile then move on to Step 3 to do your testing. IMPORTANT: Remember that all of your testing needs to be saved in a spool session so that it can be submitted to the Dropbox for grading. Having created a package that contains program units to support the movie rental process is a major step in customizing the new database. As application modifications are made in the future, however, we need to be able to identify all object dependencies to test changes. For this step in the lab, you are to use either data dictionary views or the dependency tree utility found in Doc Sharing (utldtree.sql file) to compile a list of dependencies for all the More Movies database objects. Remember that an object is anything that was created using the CREATE statement. Present your finding in a separate Word document in a tabular format as in the following sample. Each dependency type should be listed as either direct or indirect. This week, we are going to continue to expand the functionality of our database schema by adding a couple of triggers to that will help us automate some of the processing we already have in place. Triggers can be used to automate repetitive tasks within the database, such as adjusting inventory levels based on other actions taken in the database. Once you have created and tested your triggers, you will need to make some adjustments to the code in the package that was created in Lab 4. For the lab, you will need to create a script file containing the PL/SQL code that will address the lab steps below. Run the script file in your SQL*Plus session using the SET ECHO ON session command at the beginning to capture both the PL/SQL block code and output from Oracle after the block of code has executed. You will be running tests to verify that your triggers are working once your package has been updated. Spool your output and name your files with your last name plus lab 5 and give the file a text (.txt) extension. For example, if your last name was Johnson then the file would be named johnson_lab5.txt. Submit both the spooled output files AND the script file for grading of the lab. 1. The trigger needs to be an AFTER INSERT trigger on the mm_rental table. We want it to be an AFTER trigger so that, in case there are any exceptions raised, the trigger will not fire. 2. The trigger needs to be able to fire for each row that is inserted into the table. 3. The trigger process will only involve the update statement to lessen the quantity amount in the mm_movie table by one for the referenced movie ID. Test your code by running the script in SQL*Plus. If you have any errors, debug them and once you have a clean compile, move on to Step 2. 1. The trigger needs to be an AFTER UPDATE trigger on the mm_rental table based on the updating of the check in date in the mm_rental table. 2. The trigger needs to be able to fire for each row that is updated. 3. The trigger process will only involve the update statement to increase the quantity amount in the mm_movie table by one for referenced movie ID. Now, we have two triggers that will handle changes in our movie rental stock each time a movie is rented or returned. Since that same process currently exists in the procedures in our package then we need to make some changes. 2. removing the update statement in the MOVIE_RETURN_SP that increases the quantity by one in the mm_movie table. Recompile the package body (you do not have to recompile the package specifications). If you have any errors, debug them and once you have a clean compile, move on to Step 4. To test your changes, you will only need to test a valid movie rental and a valid movie return. The following steps will help you with the process. 1. Query the mm_movie table to see all data for movie ID 1. 2. 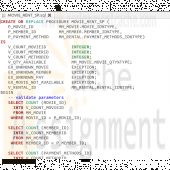 Execute the movie_rent_sp procedure in the package and use 1, 13, and 2 for the parameters. 3. 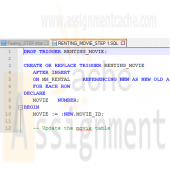 Query the mm_movie table to verify the change in quantity for movie ID 1. 4. Query the mm_rental table to get the current rental ID for movie ID 1. 5. Execute the movie_return_sp procedure in the package using the rental ID from Step 4. 6. Query the mm_movie table to verify the change in quantity for movie ID 1. This concludes the Lab for Week 5. This week, we are going to make a change to the processing in our schema by altering one of the procedures contained in the package previously created. At this point, we have dealt with procedures that required us to pass parameter values each time the procedure was executed. This type of processing greatly limits the ability to process large amounts of data efficiently. The lab this week will introduce you to a couple of the procedures contained in the UTL_FILE package that is part of Oracle's group of built-in packages. By using the GET_LINE and PUT_LINE procedures contained in UTL_FILE, you will be able to process multiple records from a file and create a results report on the events performed by your movie rental procedure with one call to execute the procedure. For the lab, you will need to create a script file containing the PL/SQL code that will address the lab steps below. Run the script file in your SQL*Plus session using the SET ECHO ON session command at the beginning to capture both the PL/SQL block code and output from Oracle after the block of code has executed. You will only need to recompile both the package specifications and the package body since you will be making a change to the movie_rental_sp procedure in the specifications. You will be running tests to verify that the changes to your procedure are working as they should. Spool your output and name your files with your last name plus lab 6 and give the file a text (txt) extension. For example, if your last name was Johnson then the file would be named johnson_lab6.txt. Submit both the spooled output files AND the script file for grading of the lab. IMPORTANT: Before beginning the lab, you will want to refresh the tables in your schema by running the movierental.sql script. Before you can effectively use the procedures in UTL_FILE to work with external files for this lab, you will need to set up your environment. The first step of this process will involve creating a directory folder under the R: drive which is the mapped drive for DBM405. The second part of the process will involve creating the Directory Object in Oracle to point to this folder. To accomplish this task, please follow the steps listed here. 1. Create the directory folder (You can refer to the SQL*Plus Tutorial in Week 1 for visuals of this process). • First, log into the iLab and open up your Oracle folder. Next, open Windows Explorer and expand the R: drive tree. • Under the R: drive, create your own folder by selecting File/New/Folder from the main menu bar. Name your folder using a unique name such as DBM405_lastname_lab6 or some other unique name. Make sure that there are no other folders under the R: drive with the same name as yours. You are the only person who has access to your folder, but the name must be unique. 2. Create the Directory Object. • In Windows Explorer (the one in the Oracle folder in the iLab), you want to take note of the path name for the R: drive. It will be DBM405\ followed by the session you are in. For example, if you are in Spring A, the path would be DBM405\SPRINGA, or if Spring B, it would be DBM405\SPRINGB. This is important because this will be used to define the path for the Directory Object. Remember that the R: drive is really mapped to the Oracle server F: drive. • Start up a session in SQL*Plus and log into your user schema. • Use the following SQL command to create the Directory Object that you will use for this lab. 3. Set up the data file. • Download the file "movierentaldata.txt" from Doc Sharing and place this file in the directory folder you created above in Part 1. You have now set up Oracle to work with the procedures in UTL_FILE that we will use for this lab. We are now ready to start updating the package that we modified in Lab 5 so that it will allow us to read a file and make changes to the database. To do this, we will need to make changes to the parameter list of the MOVIE_RENT_SP procedure to reflect a new process. Since we will be changing the parameter list, we will need to make changes to the Package Specifications as well as to the Package Body. For the change to the Package Specifications, you will need to define a parameter for the Directory Object, one for the input file, and one for an output file that will be used for a verifications report. 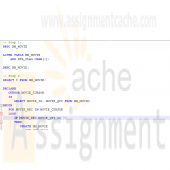 Each of these parameters can be defined as VARCHAR2 data types. Now, we can move on to the Package Body and the MOVIE_RENT_SP procedure itself. The first thing you want to do is make sure that the parameter list in the procedure matches the parameter list that you just changed in the Specifications in Step 2. The two parameter lists must match exactly or you will get errors when trying to compile the Package Body. You will also need a variable to hold the record data that will be read in and a variable to hold record data that will be written out. Check the length of the data in the movierentaldata.txt file to determine the length for the input data variable. For the output data variable, you can use your own judgment, but using VARCHAR2(80) would probably be more than adequate. The last thing you will need to add is a variable to act as the handle for the input record and one for the output record. Remember that the name for these is not important, but they must be based on the FILE_TYPE data type. Now, we move to the body of the code and the BEGIN section. The first thing that needs to happen is to open both the files. Remember that we are going to set up our processing just like we would any IPO logic, i.e., we need to open the files, read a record, process the data, read the next record, and repeat this process until there is no more data. 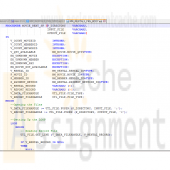 To accomplish this first step of opening the files, you will need to initialize the two variables you declare to handle the files. For the input file, you will need to use the FOPEN program. 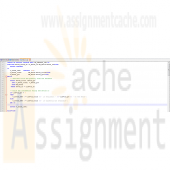 Remember that you have to pass this program three variables: the name of the parameter for the directory object, the name of the parameter for the input file, and the mode the file is to be in. For the input file, the mode needs to be "r", and for the output file, the mode needs to be "w". An example of what your code might look like can be found in the lecture material for this week. Since our code in its current format is designed for only one set of input values (remember that in previous labs we were using an EXECUTE command and then passing data to the procedure) and we now want to process multiple records of data, we need to make a change to the overall structure of the code. We need to put all of the processing in the body of the procedure after the files are opened into a basic LOOP using the LOOP/END LOOP commands. Also, we will need a new BEGIN section inside this LOOP that all of the existing code will go into. The basic structure of body of your code should look like the following when you complete this step. Now, we need to get our data record so that we can process the data brought into the program. To do this, we need to read a record using the GET_LINE program in UTL_FILE. This involves using the UTL_FILE.GET_LINE process while passing the file handle variable and input record variable to the GET_LINE program. Once the record is in the input variable, we then need to parse out the individual pieces of data (movie ID, customer ID, and payment method) from the record using the SUBSTR function. Remember that the parameters for the SUBSTR function are the record variable name, the value for the first byte of data we want to pull, and the length of the data. For example, to get the movie ID from our record, the code might look like the following. This would pull two bytes of data from the data record and put them in the variable p_movie_id. Now we can use the variable in our code that follows to see if that movie ID exists in the mm_rental table. You will need to repeat the process above for the member ID and the payment method. Do all three together between the line of code that reads the file and the first SELECT statement. If you have used the same names for your three data variables that you used for the original parameter names in the previous lab then you should not have to make any changes at all to any of the SELECT statements or the INSERT statement in the main body of code. Now, we need to set up the processing that will create the output data that will go into our output validation record. To do this, you will be using the PUT_LINE program within UTL_FILE. There are going to be six different places you will want to write out a record. The first will be after the insert statement when a new rental record is added to the mm_rental table. To create this output line you can concatenate variables and character strings together to create the data record. For example, to create an output line that would read "Rental record 13 for member 10 has been added" after the new record has been inserted, you would use code similar to the following (keep in mind that your variable names might be different). This same type of process and format will need to be repeated for each exception handler that in the previous lab used the DBMS_OUTPUT.PUT_LINE package and procedure. In these cases, your output line is already formatted and set, you just need to replace the DBMS_OUTPUT.PUT_LINE with the initialization of your output record and then add the UTL_FILE.PUT_LINE code. There is one final step that has to be taken care of before you can start testing your code. Since we are reading a record file within a LOOP we need to be able to EXIT out of the loop after the last record has been processed. To do this you will need to add a NO_DATA_FOUND exception to your main exception handling section. This exception handle must be added before the WHEN OTHERS exception handle (remember, that on has to be last). This exception handle will have three pieces to process. The first will be some form of message stating that all the records have been processed and this is the end of the report, i.e., ALL RECORDS PROCESSED - END OF REPORT. The second piece will be a line that will close the output file using UTL_FILE.FCLOSE. The only parameter you will need to pass is the name of the output file variable. This must be done or your output file will not have any data in it. The third thing will be the word EXIT which will tell the program to exit out of the loop. You are now ready to compile your package specifications (must be done first) and then the package body. Debug any errors you might have and then run your test. For this lab, you only need to test the MOVIE_RENT_SP procedure of the package. To do this, enter an EXECUTE command for the package.procedure and pass the name of your Directory Object, input file name, and output file name to the procedure. IMPORTANT: The Directory Object name MUST BE IN UPPERCASE! This is the way it is stored in the data dictionary in Oracle and if it is not in uppercase, an error will be generated. Your call to the new procedure should look similar to the following. The output in your output file should look similar to the following (the wording may be different but the processes recorded should be the same). There is no movie with id 13. Cannot proceed with rental. There is no member with id 20. Cannot proceed with rental. There is no payment method with id 7. Cannot proceed with rental. Rental record 13 for member 10 has been added. Movie id 5 is not available at this time. Cannot proceed with rental. This concludes the Lab for Week 6. The More Movies company has hired you to redesign a database system for them that can facilitate the process of renting out and returning movies. They already have an Oracle database that stores information about movies, members who rent the movies, and the rentals. This is the database that you already have become familiar with and the one which includes tables: MM_MOVIE, MM_MOVIE_TYPE, MM_MEMBER, MM_RENTAL, and MM_PAY_TYPE. The machine on which this database is running has both the server and client Oracle9i software installed on it. Every night, a clerk updates data to account for the day's activities, and periodically the reports are run to summarize business, show renting trends, etc. Access to the database is accomplished using a SQL*Plus environment that is very similar to the iSQL*Plus that you know from the previous database course. This business process worked okay for as long as More Movies stayed a very small business. However, the company has grown substantially, expanding its operations to more movie selection and more members, and consequently, it has moved to a larger location. It occupies a two-story shop now. It became very impractical to record rentals at the end of the day. They also do not want to rely on clerks knowing any SQL programming in order to record updates and run reports. In short, there is a need for a more convenient database system. The machine on which the database is currently running is powerful enough to host the database server. The database should be accessible from four checkout stations that process renting out and returning movies. This system should have an easy-to-use graphical user interface access. For the lab, you will be creating several documents to be submitted for the lab. Be sure that you save the documents with your last name and lab7 in the file name. Place all documents into a single ZIP file and submit for grading. Describe what software you propose to use to develop the front-end GUI application for the new system. Be sure to justify your choice. Keep in mind portability, ease of use, scalability, and ability to update. What other options have you considered? In setting up the servers and environment, do you propose to use middleware? If so, what kind, and where would you deploy it? Provide a system diagram of the proposed system. Be sure to include such things as servers (application and database), user clients, and any other special pieces to the puzzle that you might think of. Provide a detailed design of the GUI screen that facilitates renting out and returning movies. For every button, or other component that provides reaction to user's events, give detailed pseudocode. Also, clearly indicate where you would use any of the PL/SQL code that you developed for the labs in this course. If the application platform you have selected does not support PL/SQL then describe how you would take the processing developed in the procedures and functions and incorporate it into the system. This concludes the Lab for Week 7.